What is KaBOOM? Have you heard it mentioned in the media or in your hometown? KaBOOM! is a national non-profit dedicated to bringing balanced and active play into the daily lives of all kids, particularly those growing up in poverty in America. Are their playgrounds in your neighborhood? Since 1996, KaBOOM! has collaborated with partners to build, open or improve nearly 16,000 playgrounds, engaged more than one million volunteers and served 7.4 million children. KaBOOM! creates great places to play, inspires communities to promote and support play, and works to drive the national discussion about the importance of play in fostering healthy lives and communities. Looking for a place to play in your hometown or while visiting a new area? Simply enter the location in the Map of Play playground finder. Isn’t this a great resource! Be sure and share it. It must be so difficult for parents without access to safe playgrounds to keep the kids active and occupied. Do you sometimes feel like we are raising a generation of “couch potatoes?” Have you ever seen a group of kids together yet all of them are playing games on their phones or devices? We need to encourage outdoor play and my friends at Valpak are getting involved. Valpak significantly expands its local community service involvement with the official launch of its “Valpak Saves” program, partnering with national non-profit KaBOOM! to bring more play to neighborhoods throughout the country. This new initiative is part of Valpak’s mission to not only be a trusted neighbor who connects people with great offers and deals, but to inspire giving back to the community and create environments that promote the importance of play to children of all ages. 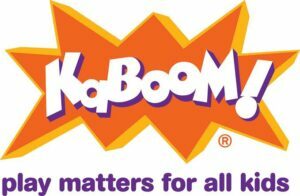 Through this partnership, Valpak will help support the KaBOOM! mission to ensure all kids get that balanced and active play they need to thrive. Valpak’s blue envelope to support this cause will begin mailing Feb. 17 to more than 40 million homes. A coupon inside will also encourage recipients to go to kaboom.org/valpak to support the effort with as little as a $5 donation to help bring play to neighborhoods in need. Valpak Saves will serve as the company’s flagship community project throughout the year, in addition to many other corporate and local community outreach initiatives Valpak supports. KaBOOM! is a national non-profit dedicated to bringing balanced and active play into the daily lives of all kids. Through its partnerships, KaBOOM! creates great places to play, inspires communities to promote and support play and works to drive the national discussion about the importance of play in fostering healthy lives and communities. Since 1996, KaBOOM! has collaborated with partners to build, open or improve nearly 16,000 playgrounds, engaged more than one million volunteers and served 7.4 million children. To learn why #playmatters: visit kaboom.org or join the conversation at twitter.com/kaboom or facebook.com/kaboom.